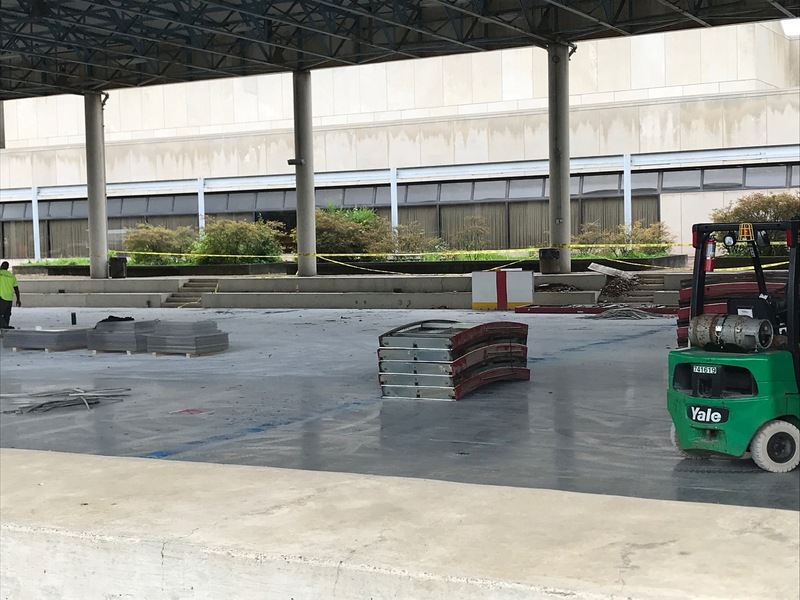 June 29, 2018 June 29, 2018 Linda Reimer Corning, Corning NY, Local History, New York State History, Public Library, Southeast Steuben County Library, Southern Tier. 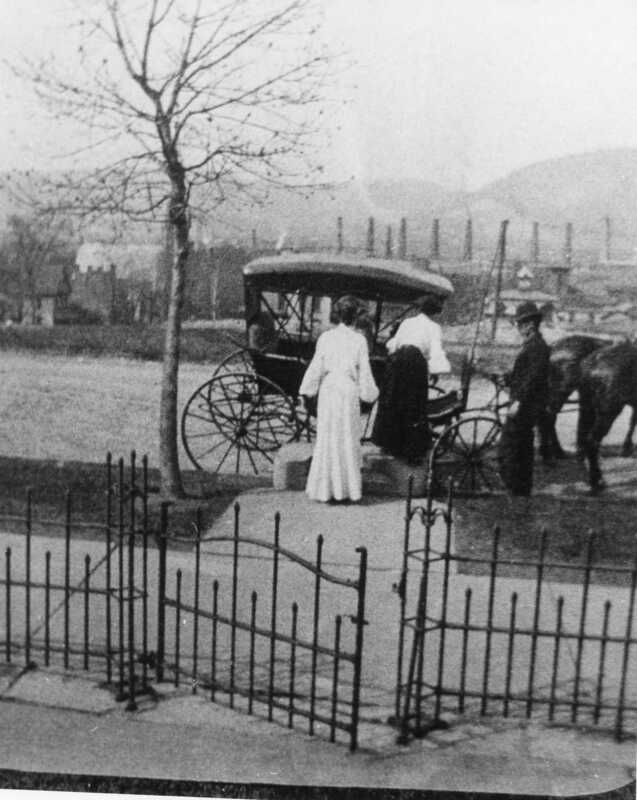 This photo appears to be of two ladies getting into a carriage on Corning’s Southside sometime in the pre-automobile days. I’m guessing those are Corning Glass Works factory smoke stacks in the background. What a neat photo! Our second photo for this week seems to be of machine workers. I’m guessing this photo was taken early in the Twentieth Century but as there is a woman working in the foreground of the photo – perhaps it was taken during World War II. 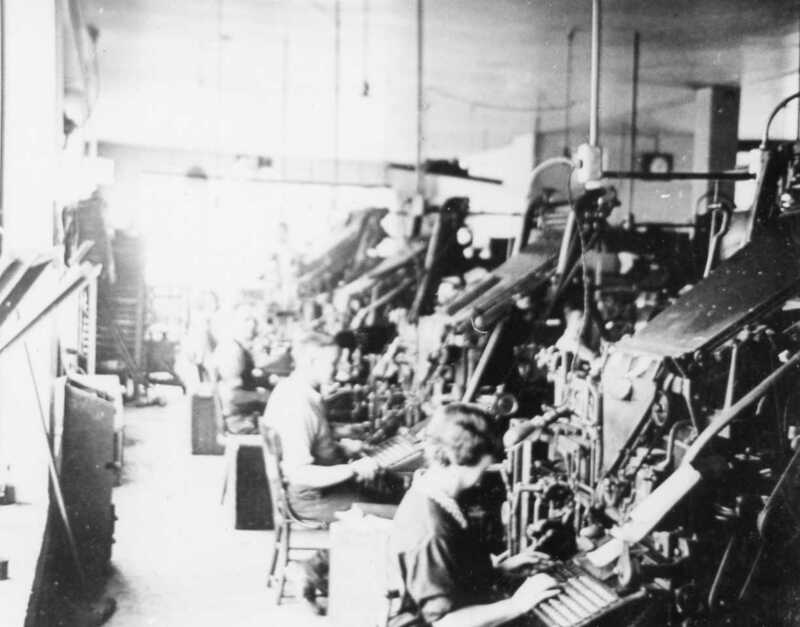 If you recognize what type of machine the workers are using – let us know! 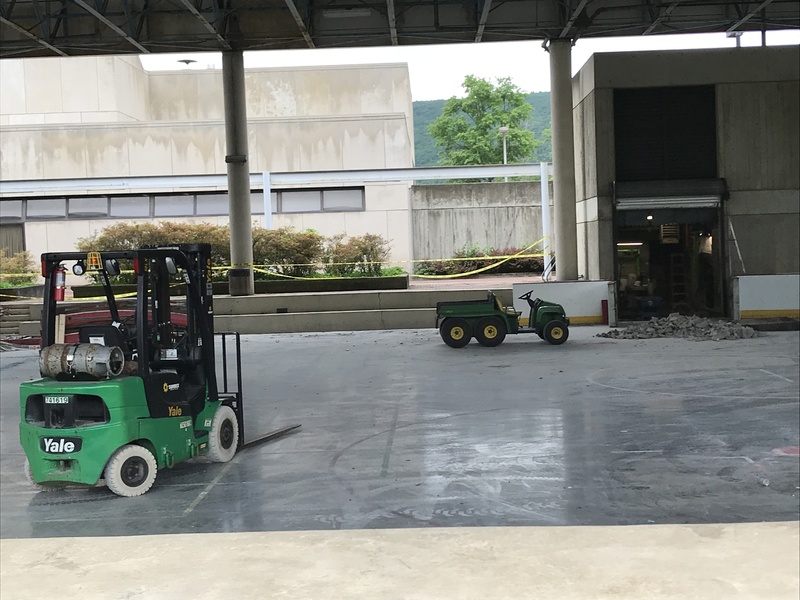 June 22, 2018 June 22, 2018 Linda Reimer Corning, Corning NY, Football, Local History, New York State History, Northside Blodgett, Public Library, Southeast Steuben County Library, Southern Tier. 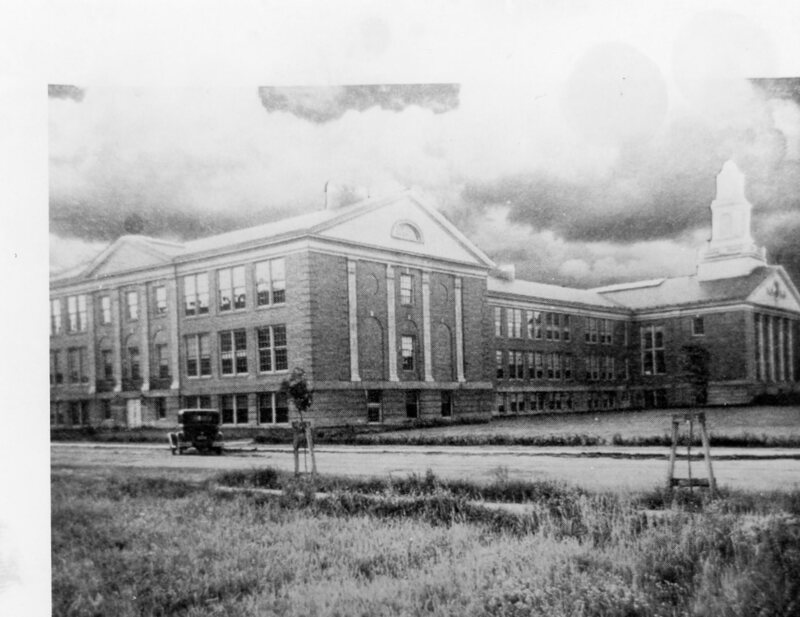 Our first photo for this week shows the recently demolished Northside Blodgett building circa the 1930s. And I’m guessing on the date based upon the car seen parked near the school. 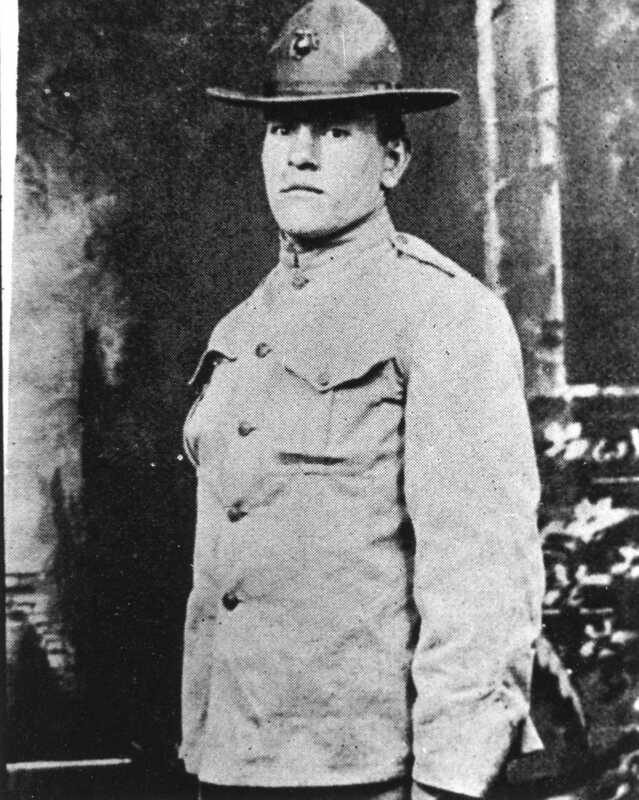 It is also interesting to note that the area where the photographer was standing seems to have been a field at the time. And sometime in the year since houses have been built on that side of the street. And our second photo this week is something of a mystery as it obviously shows a football team; but which football team and what year the photo was taken remain a mystery. 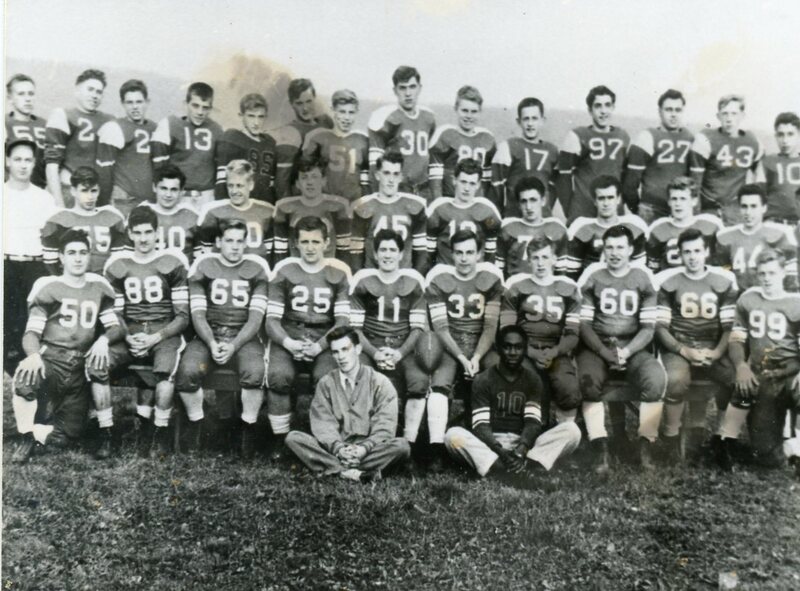 If you know anything about the football team seen in the photo or the players on the team – let us know! 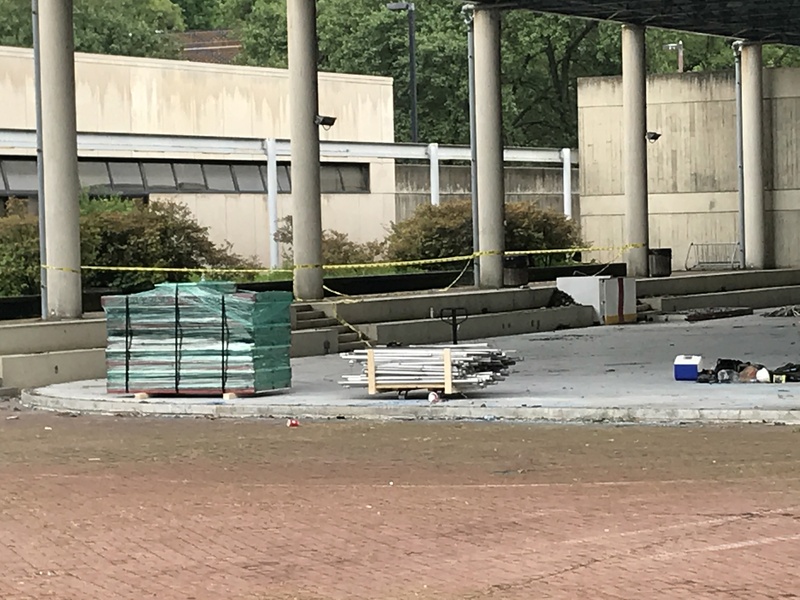 June 15, 2018 June 15, 2018 Linda Reimer Civic Center Plaza, Corning, Corning NY, Ice Rink, Local History, Methodist Church, New York State History, Painted Post, Public Library, Southeast Steuben County Library, Southern Tier. 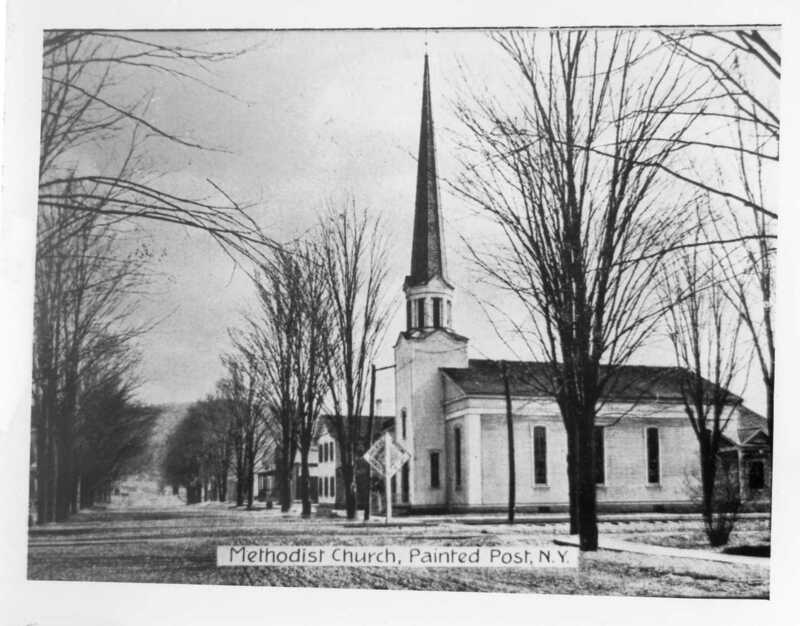 Our first photo of the week showed the old Methodist Church in Painted Post. 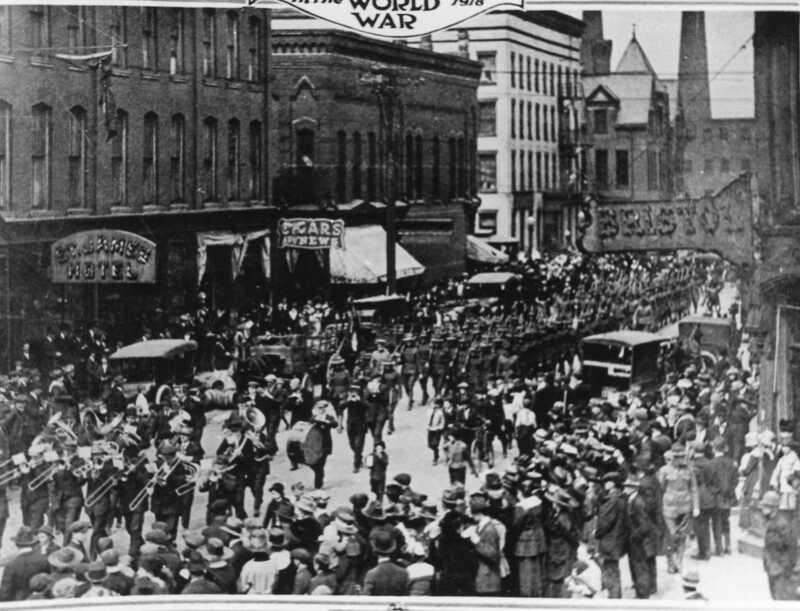 When the photo was taken or where are a mystery – perhaps it was located on Steuben Street or Charles Street? If you know, let us know! This photo was obviously taken on January 4 of some year in the past. 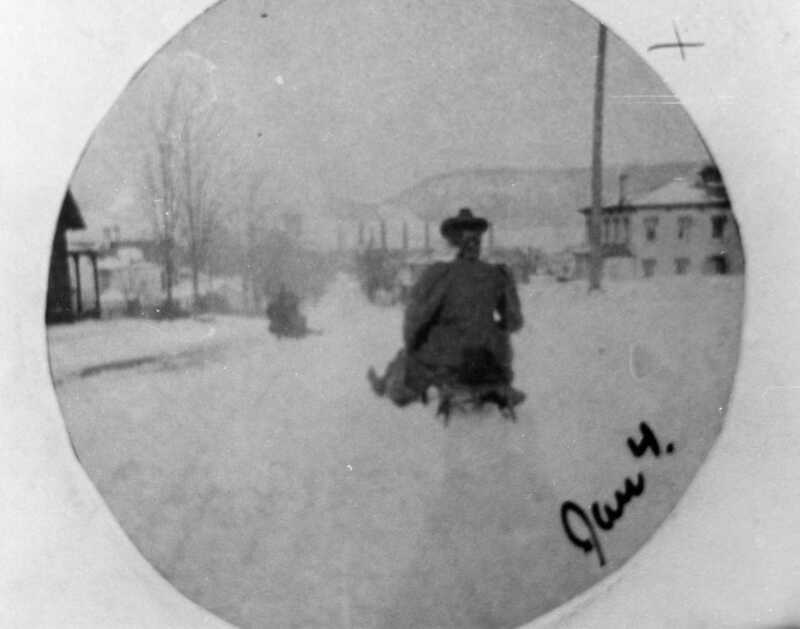 And it appears that the gentleman sledding down the hill — is sledding down a street on the south side hill in Corning. You can see what might be Corning Glass Works smoke stacks in the distance. And what a hoot to see an adult on a sled wearing a fancy hat! I’m showing my vintage I know, however, I only remember men in my grandfather’s generation wearing old school hats and coats like the ones the sledder has on. And to see him sledding down the hill in his fancy hat is just plain fun! 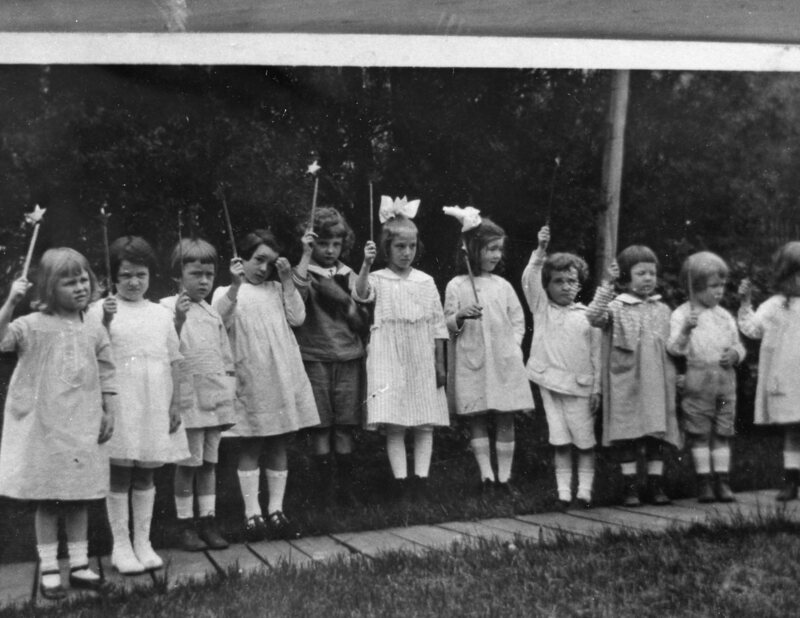 If you recognize where this photo was taken, let us know! 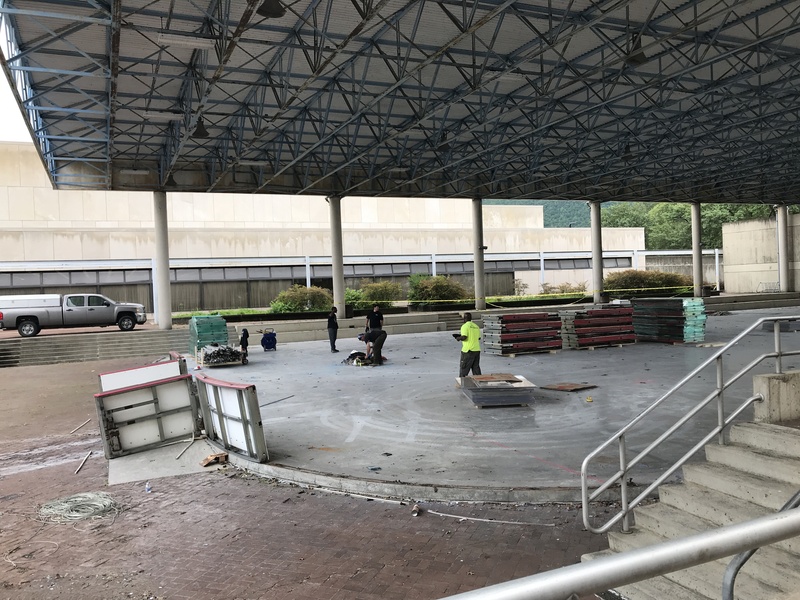 The City of Corning is upgrading the Civic Center Plaza Ice Rink. And, obviously, they have to tear it apart to upgrade it! 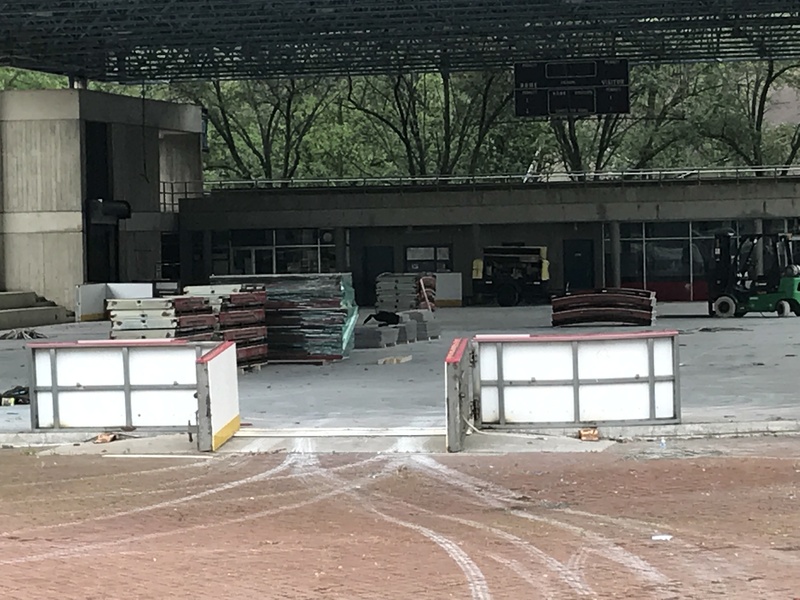 Here are several photos I took yesterday showing they work in progress. 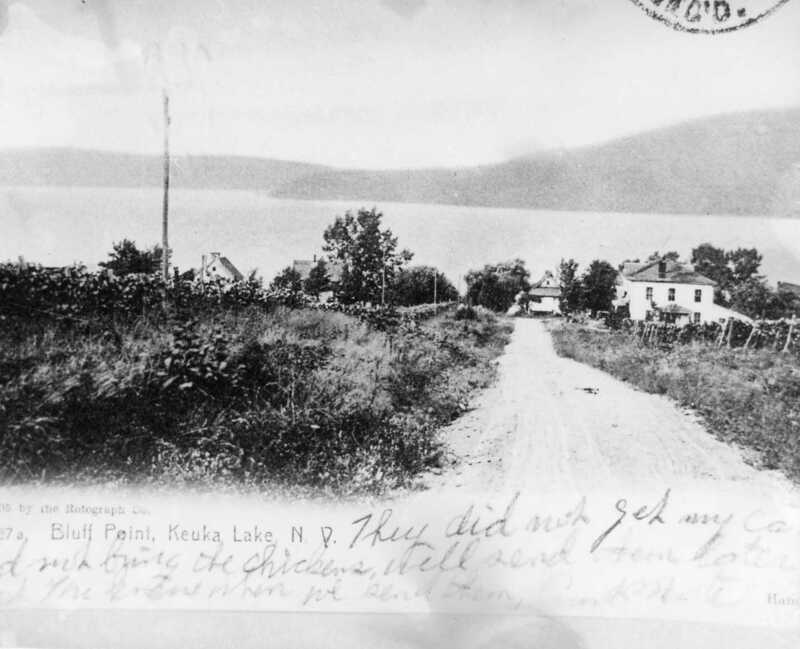 Just in time for the advent of summer our first photos shows an old postcard of Bluff Point, Kueka Lake. 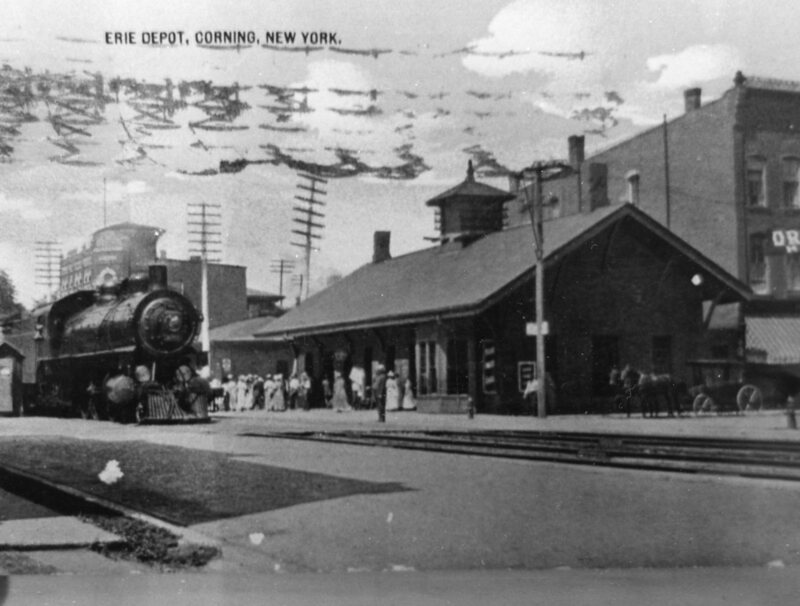 And our second photo of the week shows the old Erie Train Depot once located in Corning and now long gone. But wow! Those women in their long skirts and the horse drawn carriages – they conjure up a great feeling of the romance of days gone by! 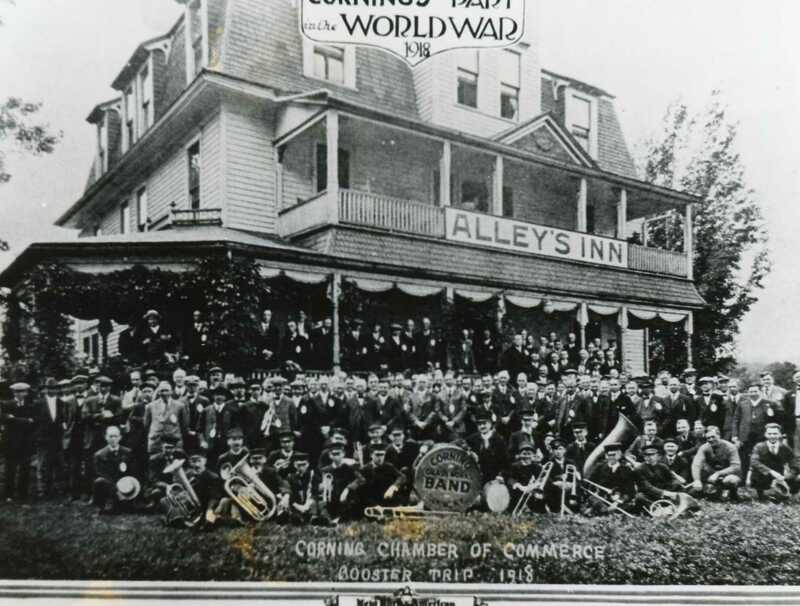 This weeks’ group of photos seem to have been taken of World War I posters and show local residents in uniform and as groups banded together to support the war effort. 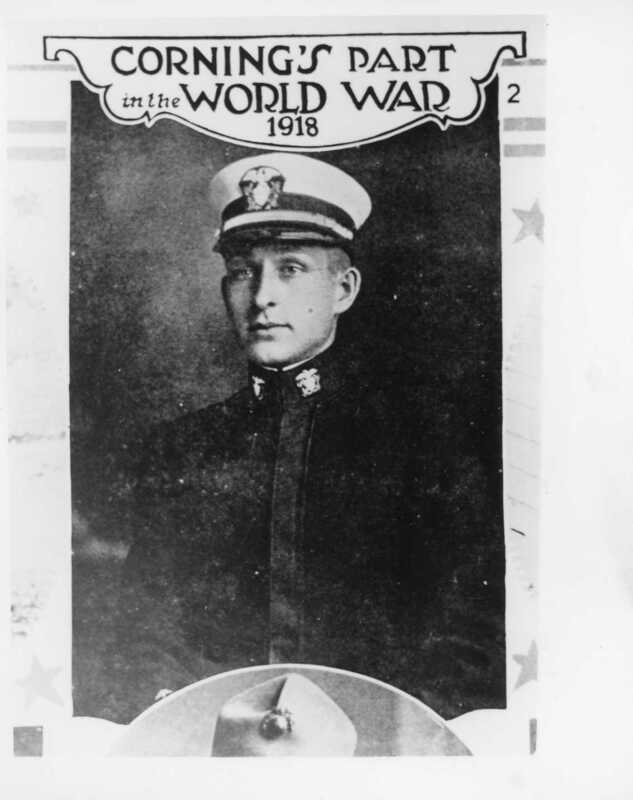 At sometime in the past someone took a great many of these photos of photos on vintage World War I posters; however, the original posters are not in our collection – so if you have one of these vintage posters and wouldn’t mind sharing a photo of it, please let us know.